On Thursday December 15, 2016, we were delighted to host the 2016 Men's Badminton Doubles Olympic Bonze Medalists Marcus Ellis and Chris Langridge for an evening of exhibition matches, on-court participation games as well as some off-court fun. It was a great follow-up to our 2014 Exhibition event, where we were also delighted to host Marcus, with Gail Emms on that occassion. The evening started with a fine display from some of our youngest hopes for the future Aahna and Sophie taking on the combined might of Marcus and Chris. They went easy on them (after all, it wouldn't be right to show up the Bronze Medalists on their victory tour) and both pairs were smiling at the end. ​Next up, Marcus and Chris split their partnership and teamed up with Freya Redfearn and Evie Burbidge respectively. A noticable increase in pace led to some fast, exciting ralleys and a close game. The game also enjoyed some lighter moments, with Chris substituting briefly with Alex Cook and some lively discussions on scoring. The final exhibition match was Men's Doubles with Marcus and Chris re-joining to take on one of Europe's best junior doubles partnerships, David Jones and Max Flynn. Marcus and Chris took the opportunity to demonstrate what a world class pair they are and David and Max were a number of points down before they really got going. Once the initial shock of pace and accuracy wore off, they were able to put some hard and exciting ralles (and points) together against their Olympic opposition. The final section of the night was a participation session, where local players could take to the court against Marcus, Chris and a number of our EPT players. Much fun was had and a competition was held to see who could take the most points off Marcus and Chris within the space of four minutes (the answer is apparently 6!). Prizes were awarded for the most points taken off of Marcus and Chris, as well as our raffle, where the top prize was a Yonex shirt signed by Marcus and Chris, with runners up prizes including Yones shuttles and a Christmas hamper. Marcus and Chris are part of Badminton England's campaign to have UK Sport's decision regarding high performance funding reviewed, part of the Bronze Medal Masterclass at Badminton Wycombe can be seen in their YouTube video (1:57 in) in support of that campaign. At the Rio Olympics Chris and Marcus delivered a superb Bronze Medal Winning Performance - Team GB's first, since Athens in 2004. 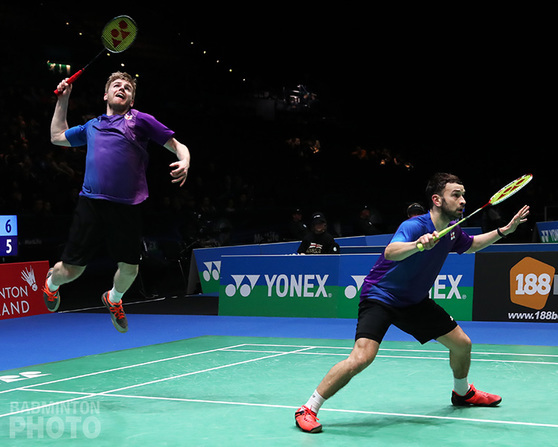 Producing England's only Olympic success in Men's Doubles, the duo displayed their talents at Wycombe Badminton Centre for one evening only.